It’s National Transit Driver Appreciation Day. To put it mildly, the folks that drive our buses and trains have challenging jobs and the professionalism these folks bring day after day, year after year is certainly appreciated in these parts with or without a special day on the calendar! 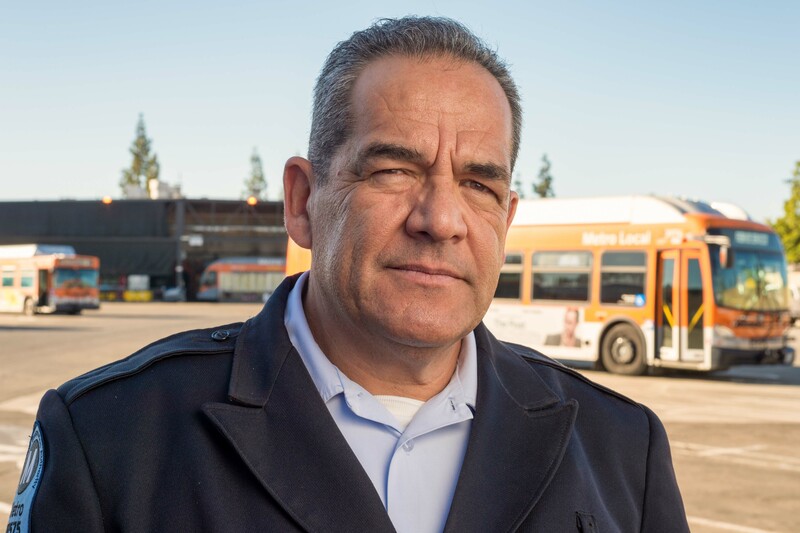 Daniel Magana, a bus operator out of Division 15 in Sun Valley. Thank you to Daniel and all your many colleagues on the bus and rail side of things! Photo by Steve Hymon/Metro. The director of the Miami-Dade police said that criminal charges are possible in the collapse of the new pedestrian bridge. Sen. Marco Rubio said that cables supporting the bridge had loosened and were being tightened when the bridge came down on car traffic below. Police say incidents of street racing are on the rise, driven by popular culture and the use of social media to draw contestants and evade authorities. In what racers call “takeovers,” participants use their cars to block off streets or intersections to stage races. Hmm. Can’t imagine the pop culture where street racing is glorified. Police have said that stopping the racing is difficult, if not impossible, due to the spontaneous nature of some races. One thought and perhaps a naive one: cars aren’t going anywhere in our region, nor will the appetite by some to race them. One thing our region has is an abundance of gigantic parking lots which, in theory, could be opened to those who want to race. I know the liability and legal hurdles to clear on that are probably insurmountable. But difficult problems often require creative solutions. Thoughts? In California, the debate over SB 827 has revolved around the need to build more housing in a state where housing costs have soared and building new housing can be difficult. The bill would pre-empt local zoning ordinances and allow more units and taller buildings near transit. In this article in the New York Times — which I’m going to charitably label as “lacking” — the bill is cast primarily as an attempt to reduce driving in California by building more housing near transit. I am not going to take a position on the bill, but I don’t think that traffic reduction is the bill’s intent. Even the bill’s proponents are not saying this bill is an attempt to shift populations in California from car-centric places to less car-centric ones. Really the entire debate has been about whether it’s appropriate to take zoning power from cities and whether the bill will actually help build affordable housing. The New York Times reporters could have, of course, driven to the sprawling New York metro area ‘burbs in New York, New Jersey and Connecticut and discovered that building a ton of housing there near transit hasn’t cured traffic. Geeshers. If the bid wins, the list of cities involved would likely include 10 in the U.S. and three apiece in Canada and Mexico. If L.A. ends up with a game, the Rose Bowl and the new football stadium in Inglewood are mentioned in the bid book as potential sites, according to a NYT source. FIFA will decide on a winning bid later this year. The men’s and women’s World Cup was successfully held in the U.S. in 1994 and 1996, respectively, and it would be great, I think, to see the Cup back on the West Coast. Plus, the United States team would get an automatic bid, so no worries about the men failing to qualify! Of course, the 2028 Summer Olympics and Paralympics are already headed to U.S. The World Cup, like the Olympics, draws a massive televised audience across the globe. Our region is already a soccer hotbed owing to its crazy diversity. LAFC joined Major League Soccer this year and their very cool new stadium in Expo Line-adjacent Exposition Park will make its debut on April 29. A cougar crossed the 101 and 118 five times, using a culvert under the 101. Interestingly, the cougar was originally traveling south — i.e. toward the population of lions in the Santa Monica Mountains. The concern from scientists is that the Santa Monica population of lions is small and isolated and interbreeding will lead to genetic bottlenecks that will ultimately wipe them out. The Santa Monicas are surrounded by ocean and freeways and the L.A. Basin, where there are no lions. Thus the importance of a proposed wildlife bridge across the 101 that would help link wildlife populations in the Santa Monicas to those in the much larger Los Padres National Forest to the north. The bridge is expected to cost $60 million and 80 percent of the funding will be coming from donations or private organizations. Here’s a good L.A. Times story about efforts to get the bridge done by 2022. Though the economy is generally strong and per capita income is high, it ranks poorly on social measures: Life expectancy has declined, suicide rates have risen, the opioid crisis has worsened, inequality has grown and confidence in government has fallen. The top 10, btw, were Finland, Norway, Denmark, Iceland, Switzerland, the Netherlands, Canada, New Zealand, Sweden and Australia. FWIW, a lot of those countries are pretty easy to get around, although some are also pretty car-centric. Unlike the IOC, FIFA is asking for exemptions from labor laws and tax breaks. Chicago, Minneapolis and Vancouver have rejected hosting any games due to this. Los Angeles would be wise to do so as well. re: portrait of Daniel Magana: Another nice portrait, Steve! Thanks much! I really appreciate the kind words. I gotta remember to post a few more and keep shooting once my current exile in Ohio ends (soon! ).